Signorina`s flacon is a statement of subtle elegance and grace. The squared design recalls a precious jewel box. On top, the flacon shows a reinterpretation of the iconic Vara bow in gros grain in two cheeky pink shades. A lovely bubble of pink gold completes this sophisticated creations with a touch of irony. The outer packaging is gracefully decorated with pink gold frames, that give a light and iconic style. The Salvatore Ferragamo logo is embossed on the top and elegantly seals the box. A perfect blend of style and freshness. A girl, a “ Signorina”, as the interpreter of an iconic love. A frame of a love story between a young woman and a young man, perfectly interpreted by Italian top-model Bianca Balti. Feminine and fresh but with a strong personality. A subtly cheeky and romantic interpretation of a young lady with the impeccable and stylish signature by Salvatore Ferragamo. 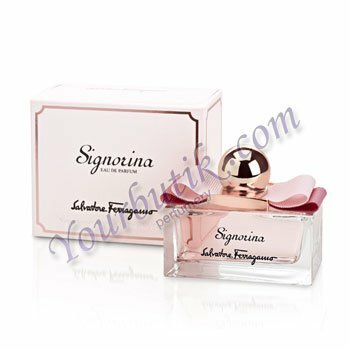 Signorina was launched in 2011.